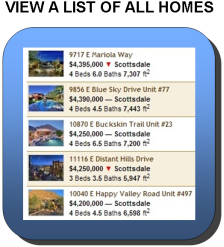 From this page you can easily browse all Estancia homes and lots for sale from the Arizona MLS. Our real estate listings are updated daily! To begin, simply click on your choice of buttons below to view a list of all homes, or to view properties by location on a map. The community of Estancia, encompassing 640 acres on the northern slope of Pinnacle Peak in north Scottsdale, is a gated enclave consisting of 223 custom home sites and 39 Tuscan-inspired villas. With breathtaking views from every home, residents enjoy the beautiful Sonoran high desert landscape. The heart of Estancia is its exclusive private golf club that includes a 30,000 square foot facility, tennis courts, pool, fitness center, and dining area. Custom home builders have designed the homes to reflect the unique terrain of each lot in an effort to provide harmony with the natural surroundings. The low density also highlights it's uniqueness. Home prices range from $1 million to over $9 million in the 24 hour guard gated community. Thinking about selling your home in Estancia? Please Contact Us or call us direct at (480) 442-8255 for your complimentary home value estimate, or to schedule a consultation. 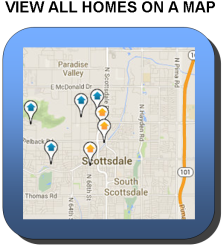 We're a local, experienced team of Scottsdale Realtors who can help you get top dollar for your luxury home.